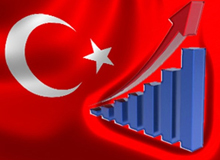 "Turkey’s economic star continues to shine," said Robert Greifeld, CEO of the international stock exchange group NASDAQ. Speaking on Thursday at the World Economic Forum at Davos, Greifeld praised Turkish capital markets and their investment offer. "What we’ve witnessed in Turkey's international growth and economic progress only furthers its investment opportunities. Nasdaq supports the dynamism of Turkey's capital markets through a strategic partnership with Borsa İstanbul, and we watch with anticipation and participate with enthusiasm as Turkey continues its upward trajectory,” Greifeld said. Glenn Hutchins, co-founder of the private equity firm Silver Lake, and a board member at NASDAQ OMX, said that the development of Instanbul as an international financial center was underway. “Turkey is taking thoughtful measures to enhance what I believe is already an attractive opportunity set for international investors. For example, Borsa Istanbul's implementation of a world-class technology platform builds confidence in the country's capital markets infrastructure for years to come," he said. Philip Bennet, First Vice-President and COO of the European Bank for Reconstruction and Development, said that the solid Turkish economy made it an attractive investment target.